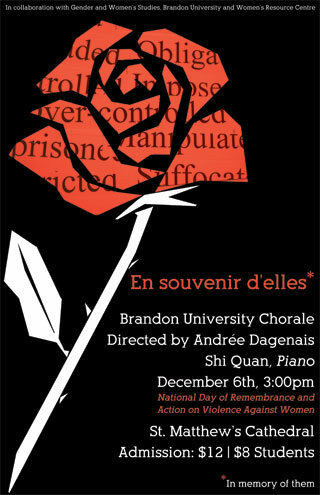 The Brandon University Chorale will present En Souvenir d’elles/In Memory of Them, a memorial performance on Sunday to help mark the National Day of Remembrance and Action on Violence Against Women. The concert will be held at St. Matthew’s Cathedral at 13th Street and Louise Avenue, beginning at 3 p.m. This concert is a response to one of Canada’s most profoundly disturbing mass murders, of 14 female students at Université de Montréal in 1989. It does not attempt to aestheticize the horror associated with the event, but aims to lead performers and the audience to hope, renewal and understanding the work that is ahead of us to eliminate violence against women. The event will include poetry, guest speakers and music by Morton Lauridsen, Michael Hurd and Arvo Pärt among others. In 1991, the Parliament of Canada declared Dec. 6 to be the National Day of Remembrance and Action on Violence Against Women. It is a time to reflect on the phenomenon of violence against women in our society. It is also a day for communities and individuals to speak out against violence against women and consider its impact on victims and their families and friends. Brandon University Chorale is a chamber choir of 22-24 students. The ensemble, under the direction of Dr. Andrée Dagenais, has performed a number of times with the Winnipeg Symphony Orchestra and for numerous community events. Their most recent tour included the Baltic countries in 2014. This event is presented by the School of Music, Gender and Women’s Studies, and the Women’s Resource Centre. Complementary tickets will be made available at the Women’s Resource Centre, YWCA, Sexuality Education Resource Center, Brandon Friendship Centre and BUSU. A reception sponsored by the Brandon University Office of the President will follow the event.